Browse: Home /	Community Building, Community Gardens, Events, Food, Intern Reports, Permaculture, Street Gardening, Sustainable Flatbush News, URBAN FARM & GARDEN / Greening Flatbush 2011 report! 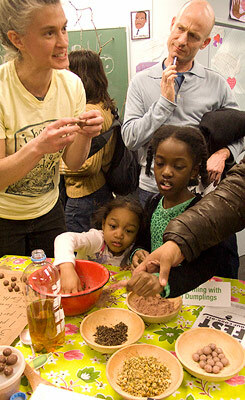 Greening Flatbush 2011 – held this past Sunday, February 27th – was a huge success! Thank you to everyone who came out and to everyone at the workshop tables. We had an amazing turn out, over 100 participants! After much time and effort put into decorating and preparing our room at the Flatbush YMCA, we were able to sit back and enjoy all the great knowledgeable people who came to do workshops! From learning how to grow our own mushrooms, planting using plastic bottles, learning about urban farms in the area, the new garden to be opened on Church Avenue, sprouting our own seeds, how to make the best use of trees in our area, and the oh-so-popular Earth Dumplings, it was a day packed with exciting info. Attendees enjoyed a great raffle and snacks and a fun time was had by all. If you missed out we hope to see you next year and once again thanks to everyone involved! Click here for more photos from this year’s Greening Flatbush!